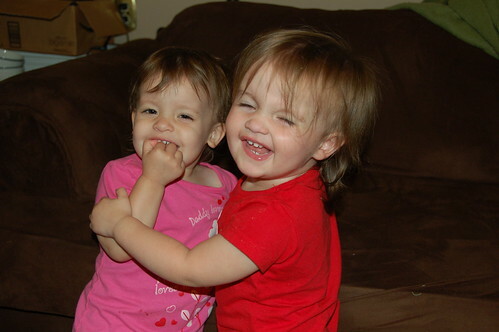 One of the unique joys of having twins is watching them develop together and interact with each other. Lately, the girls have really started to entertain us in how they play with each other. Gracie’s always been a “hugger”, but now Erin is starting to get in on the action too. The best part is when she wraps her arms around Grace and then Grace leans her head in on Erin. Erin looks so much bigger in this picture it almost looks like she’s Gracie’s big sister. This is about the cutest thing we’ve seen in a long time. 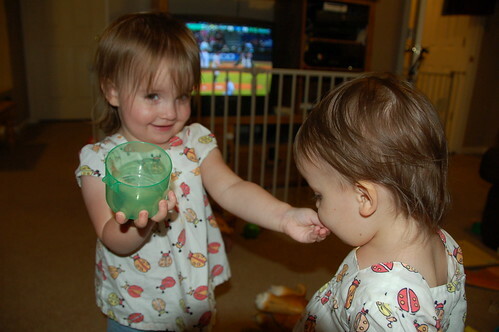 In this picture, Erin is pretending to “feed” Gracie, handing her imaginary food out of a cup. The best part is that Gracie would then “pretend” chew it and say “yum! yum!” or “more! more!” I guess picky Gracie doesn’t mind whatever good thing Erin is feeding her. 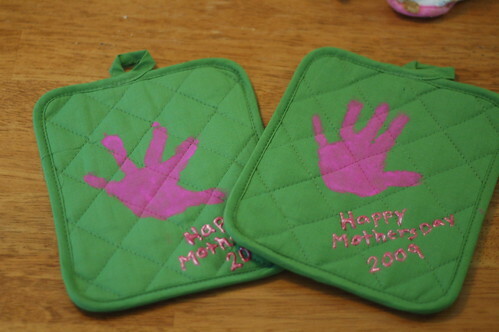 The girls made some presents for mommy at day-care this weekend. See if you can guess which one’s Grace and which one’s Erin. They pretty much fit their personalities. Happy Mother’s Day to all of you with children or expecting children!